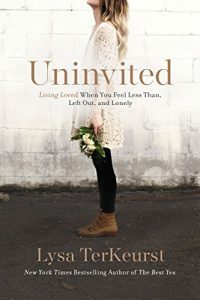 I am going to start doing a book club/study this fall on the newest book by Lysa Terkeurst called “Uninvited!” I will give more details as the time gets closer! I am super excited about this book. I have a feeling I will be highlighting, underlining, and circling EVERYTHING! This is going to be life changing for me! 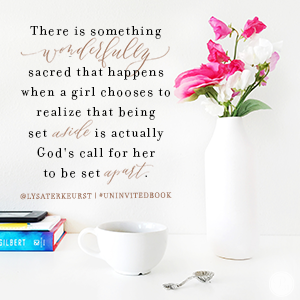 I hope you’ll join me as we dig deep into His Word and this book together. It’s a fresh word in my life right now! I shared a vulnerable post yesterday in the hopes of cultivating authenticity. I want to keep this going as I know I’m not alone in this struggle! I have felt God set me aside for a time with all this. It’s a sacred time in which He and I can spend more time with each other! He is relentlessly pursuing us! He will do whatever it takes to keep us from things and faulty thinking that will ultimately destroy us. Sometimes His seemingly harsh dealings in our lives are actually His mercies which He promised would follow us all the days of our lives. “She will chase after her lovers but not catch them; she will look for them but not find them. Then she will say, ‘I will go back to my husband as at first, for then I was better off than now'” (Hosea 2:7 NIV). “You have abandoned your first love. … Repent and do the things you did at first” (Revelation 2:4). This Scripture is referring to Israel’s unfaithfulness toward God. We are alike in that when we chase after anything that God has not given us or that which we are hoping will fill us, we are being unfaithful to Him. We have ultimately abandoned our first love. He alone can truly satisfy the longings of our hearts. It is better for us that we return to Him, our husband (our bridegroom)! As if His death, burial and resurrection weren’t enough, His Spirit woos us to Himself again and again!